Regeneration of amputated body parts is uncommon but does exist throughout the animal world–from salamanders, spiders and sea stars that can regrow appendages to a species of ribbon worm that can regenerate an entire individual from just a small sliver of tissue. But regenerative abilities were broadly assumed to be an ancient trait that some species managed to hold on to while most others lost through evolution. This new study, which was published in the March 6, 2019 issue of Proceedings of the Royal Society B, turns that assumption on its head. 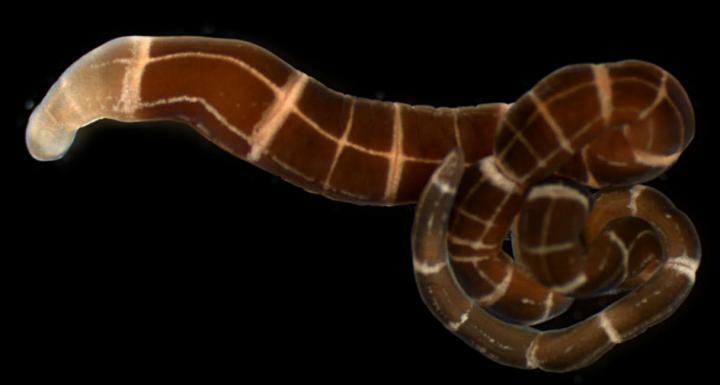 In a survey of 35 species of marine ribbon worms, the researchers found that the ability to regenerate an entire head, including a brain, evolved relatively recently in four different species. All animals have some degree of regenerative ability. Even humans re-grow damaged skin over a wound. However, animal lineages that diverged very early in evolutionary history–such as sponges, hydroids and ctenophores–are often able to regrow entire individuals from even small amputated parts. As animals evolved greater complexity, regenerative abilities have become less dramatic and common. Estimating where and when changes in regenerative abilities occurred on the tree of life is fundamental to understanding how regeneration evolves and what factors influence the trait. Until now, scientific understanding of how regeneration evolved was based solely on studies of animals that lost regenerative abilities. That’s because all known gains in regenerative ability occurred too far in the distant past for comparative studies. This new research presents the clearest documentation of animals gaining regenerative abilities and could shed light on the characteristics necessary for the trait to evolve. To conduct the study, the researchers collected ribbon worms along coasts of the U.S., Argentina, Spain and New Zealand from 2012 to 2014. They performed regeneration experiments on 22 species, bisecting them front to back and observing their ability to regenerate. They also obtained information on 13 other marine ribbon worm species from previous studies. All of the species were able to restore themselves to complete individuals by re-growing back ends. Only eight species were able to regrow their heads and restore an entire individual from just the back portion of the body. Four of these were known from previous studies and four were new. More surprising than the number of ribbon worms that could re-grow heads was that the majority of them could not. Studies from the 1930s of the ribbon worm Lineus sanguineus showed it to be a champion of animal regeneration with the ability to regrow a whole body and head successfully from the equivalent of just one two-hundred-thousandths of an individual (that’s like re-growing a 150-pound person from just 0.012 ounces of tissue or roughly 1/16th of a teaspoon). That example saddled the entire phylum of marine ribbon worms (known as Nemertea) with a reputation for being super regenerators. The natural assumption was that it was an ancient trait passed down from a common ancestor that some ribbon worms began to lose as species diverged. However, with their survey of 35 species, the researchers reconstructed the evolutionary pattern of regeneration across the phylum and found it to be a more recently evolved ability, even among super regenerators like Lineus sanguineus. In evolutionary terms, that’s recent history given that regenerative abilities are thought to have first evolved before the Cambrian Period more than 500 million years ago. Opportunities to study gains in regenerative abilities can greatly improve scientists’ understanding of the developmental strategies that enable and enhance regeneration. For example, some of the non-head regenerating worms in the study survived months without heads. That could indicate a possible precursor to evolving the ability to regenerate a head, because surviving an amputation long enough for regeneration might be the first evolutionary step. An additional co-author of the research paper from UMD is Eduardo E. Zattara (Ph.D. ’12, behavior, ecology, evolution, systematics). This work was supported by a University of Maryland-Smithsonian Institution Seed Grant (Award No. 10661), Spanish Ministry of Economy and Competitiveness (Award No. BES-2013-063551), and the National Science Foundation (Award No. IOS-1030453). The content of this article does not necessarily reflect the views of these organizations. The research paper, “A phylum-wide survey reveals multiple independent gains of head regeneration in Nemertea,” Eduardo E. Zattara, Fernando A. Fernandez-Alvarez, Terra C. Hiebert, Alexandra E. Bely, and Jon L. Norenburg, was published in the journal Proceedings of the Royal Society B on March 6, 2019.